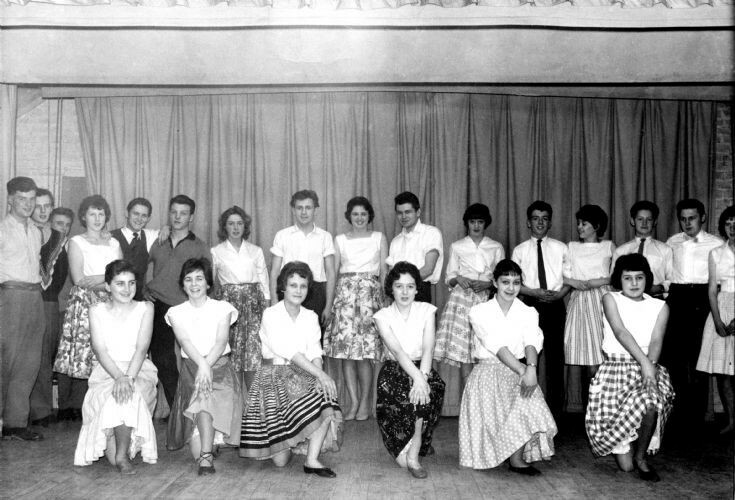 I can find no more details of this photograph but I surmise that the cast are members of the Handcross Youth Club performing in the Parish Hall. I can identify most but there are three “unknowns”. Please can anyone name tham? 1 John Davey, 2 Christopher Johnson, 3 David Knape, 4 Doreen Kemp, 5 Ron Cosens, 6 Unknown, 7 Unknown, 8 Alan Streeter, 9 Penny Housby, 10 Barry Ray, 11 Rosemary O’Shea, 12 Derek James, 13 Barbara Housby, 14 Bob Mills, 15 Donald Wheeler, 16 Daphne Boxall, 17 Unknown, 18 Janet Housby, 19 Pat Rees, 20 Janet James, 21 Rita Mitchell, 22 Gill Leppard. The Large Version shows a numbered close up. I'm, pretty sure that no.17 was my girlfriend Wendy at the time, who sang and played the guitar. Shamefully, I cannot remember her surname. Please can anyone remind me? She had an older sister.